Resources to Finding Wellness, Happiness, and Peace in Everyday Life! Research suggests that social support is highly effective in lowering stress and the feeling of burnout in teachers (i.e. Greenglas, Fiksenbaum & Burke, 1996; Halbesleben, 2006; Larrivee, 2012; Luskin & Pelletier, 2005; Simbula 2010; Seligman, 2011a). Support from colleagues has also been linked to retention (i.e. Houkes, Janssen, de Jonje & Nijhuis, 2001; Ingersoll & Strong, 2011, Leung & Lee 2006; Whitaker, 2000). In addition, there are significant benefits to meeting and sharing journals face-to-face as part of a support group. Based on the research mentioned above, we thus incorporated monthly meetings as part of our Guided Journaling for Teachers Support Group (GJTSG). In these monthly meetings, journaling teachers and teacher educators come together as a group over a period of ten months during the duration of one school year. As an incentive for the teachers to participate, the meetings take place on a regular work day. During these monthly meetings, journal entries are being analyzed and checked by the teacher educator for a balanced approach of entries in regards to observations and reflections. Based on the analysis, the teacher educator might feel the need to clarify or reformulate instructions or assignments, or give additional support in regards to writing. volunteers a specific issue or observation that affected her and that she consequently wrote about in her journal. She reads excerpts from her journal to the group and also points out how she dealt with the issue. In a following conversation, participants ask questions, discuss her approach, reflect on her conscious or unconscious doings, discuss options, offer alternative solutions or develop new strategies. The teacher, who read from her journal, then chooses one or two of the suggested solutions to try them out. She also picks another teacher from the group she is going to team up with via phone, email or in person, during the next month to share her progress in solving the problem. This process is repeated for various issues shared by the group members. Every monthly meeting the group leader follows up on the progress made. Research suggests that journaling can be a helpful learning tool (i.e. Bennet and Kingham 1993). Not only does the journal-writer benefit but also the reader or the audience the journal is shared with, for example, fellow teachers and teacher educators,(i.e. Halbach, 1999; Thomas, 1995b). For that reason teacher journals are often being used as part of teachers’ professional development (i.e. Rao et al. 2003). The date, time, location, participants or anything else such as unusual weather or fire drill etc.A description of the behavior of the person or people involved in the event, for example, what was said, body language, facial expressions etc. (before, during and after the event).The context, for example, environment, circumstances, surroundings, motive, mindset, frame of reference, conditionsIf applicable: The directions or activities given by the teacher (before, during and after the event)If applicable: The response of the person or people involved. A Guided Journaling Teacher Support Group may be operated by a school, school districts or a consortia of districts. Schools can implement this program on their own, in partnership with other schools, in association with a local teachers association, a college or university, or a state department of education. A Guided Journaling Teacher Support Group makes minimal demands on the district and school resources. It is relatively low-cost and time effective. Participation in support groups can be increased by providing release time for teachers and group leaders, that is support group meetings can be scheduled during regular work days with the help of substitutes and creative use of staff development days. Journaling benefits for the writer can be manyfold. They are generally connected to the process of journal writing (Reis 1994) and the product (Thomas 1995, p. 5; Holly 1989a, p. 71). Following, we will look at these benefits in more detail as well as journaling as a therapeutic tool.A journal is a documented record. Thus, it can be revisited many times after its completion & re-interpreted in hindsight. Why is sitting more hazardous than parachuting? Working hard and spending hours at your desk? Suffering from neck and back pain? Feeling the midday work slump? 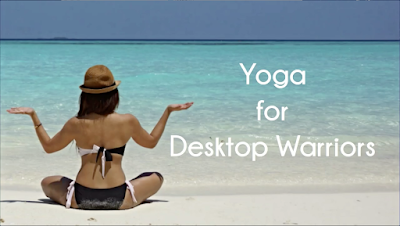 Yoga for Desktop Warriors might just be the solution. Simple chair yoga routines like this provide quick and easy stretching techniques that are ideal for working those painful kinks out of your body, increase your metabolism, and optimize work performance. (adapted from Murphy (2008)model humility, curiosity, and a willingness to learn from group members.look, listen, ask, and learn as much as possible before offering suggestions.treat group members as experts regarding themselves and their circumstances, and as active contributors to their own solutions.respect group members freedom to accept or reject suggestions and to adopt them to their own unique situation.respect diverse opinions, cultural backgrounds, and new ideas.listen for hints of strength, resilience, hope, and other resources.ask open, change-focused questions. The goal of Guided Journaling Teacher Support Groups (GJTSG) is to provide a service for teachers that helps reduce job-related stress and burnout, increases retention, and improves teaching effectiveness through the use of best practices.